The Fall of the Year, by Howard Frank Mosher. HoughtonMifflin, 278 pages. $24. In a recent review of Chris Bohjalian's novel, The Law of Similars, Pip Vaughan Hughes suggests writing that shows "reverence for even the most mundane aspects of the Vermont experience" may indicate the state itself has become a literary convention. If he's accurate in this assessment, then smart literary money will follow the maxim innkeepers have traded on for generations: Give people the Vermont they want. These sentimental writings probably won't be remembered — the notion that literary work should endure is now as quaint as a covered bridge — but neither are they likely to be criticized for misrepresenting Real Vermont. The only people who know what Real Vermont is are too poor, illiterate or exhausted to care. And you can bet they didn't get a visit from Oprah during the Midwives media blitz. 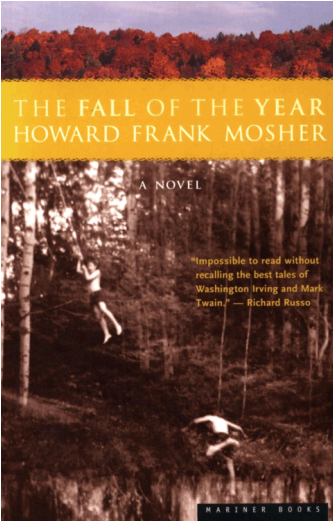 The Fall of the Year, the newest novel from Vermont writer Howard Frank Mosher, advances the state's pristine image in contemporary fiction. Though the story's setting was inspired by the isolated, rugged haunts of the Catskills, where Mosher grew up, and Vermont's Northeast Kingdom, where he currently lives, the work paints a portrait of rural life fable-like in its whimsicality and quaintness. This cheery tone may derive from a dual authorial intention: to tell an engaging tale while also paying tribute to the people who have charmed Mosher since his arrival to the "Kingdom" more than three decades ago. The author has, in fact, referred to the novel as "a fictionalized memoir," tracing several key characters directly to people in his life — himself, for one, as well as an uncle. Then is it a memoir or a novel? Mosher seems to have aimed straight for the middle — and found it. As a novel, the results are mixed. At his best — the rollicking Prohibition-era novel Disappearances, the tense country-crime story A Stranger in the Kingdom — Mosher uses his considerable storytelling gifts to serve his readers first, his sources last. These earlier works, along with the novella and stories collected in Where the Rivers Flow North, demonstrate impressive stylistic range. Disappearances itself is a remarkable literary achievement: a veritable magical-realism-of-the- mountains, a wild ride through the woods of the Vermont-Canada border region in the company of characters possessing that oft-cited "independent spirit" in superhuman measure. Stranger and Rivers, in contrast, explore the complex psychology fueling this independent spirit, turning up the good and the bad — the Bible, bigotry and pure stubbornness — with unflinching candor. In The Fall of the Year, Mosher's sense of adventure and psychology are more muted. Though there are flashes of each here, and the narrative is at times compelling, the novel is suffused with the kind of earnestness of tone that made John Boy Walton the nicest guy an entire nation ever wanted to smack upside the head. Set in Mosher's mythical Kingdom County in the late 1950s, The Fall of the Year begins as Frank Bennett, a recent college graduate, returns home to Kingdom Common for the summer. The adopted son of great-uncle and priest Father George Lecoeur, Frank is himself bound for the seminary come fall. The ensuing events present him with various reasons not to go through with the plan — chiefly, stirrings of romantic love and an ever stronger urge to pursue the writing vocation. Winding around this central narrative thread are colorful local characters and mysterious outsiders, secondary love stories, the tale of a family feud and a bit of hunting and fishing. Yet aside from the disclosure that Frank's parents were killed in a traffic accident when he was a young boy, which put him in the care of "Father G," The Fall of the Year maintains a rosy, innocent outlook throughout. Of course, dramatic tension does not require that some character meet a tragic fate, but Frank's aw-shucks viewpoint tends to coat his observations with a sweet veneer that often reads as false sentiment. Although Fall is not always convincing, the world Mosher has created — here as well as in his other works of fiction, all of which are set in Kingdom County — is altogether inviting. As in A Stranger in the Kingdom, the bulk of the action in the latest novel takes place squarely in Kingdom Common, creating a richly detailed microcosm. Whereas Stranger brought a dark-edged dramatic conflict to the Common stage, however, The Fall of the Year uses the setting more as a canvas upon which Mosher draws character sketches and virtually self-contained stories. The first chapter, "The Savant of Kingdom Common," introduces the trash-picking idiot savant Foster Boy Dufresne, whom "Father G" commands Frank to befriend. By chapter's end, when Foster Boy has left the Common, he has more or less left the novel as well. The new story that begins with chapter two, "The Journey," is perfectly charming — a flash of fantasy involving the miraculous disappearance of two bread-baking sisters that recalls Marquez's One Hundred Years of Solitude more than any scribe of the New England woods. But the inexplicable end of Sylvie and Marie Bonhomme doesn't relate directly to the story of The Fall of the Year, beyond bringing Frank into contact with the saucy breadbaker's assistant, who will occupy his thoughts for the rest of the summer. In his 1997 memoir, North Country, Mosher notes that his writing has drawn criticism for following the conventional beginning-middle-end structure. The Fall of the Year could not be similarly criticized. If it is a novel, it is a short one — and one that begins subtly in the second chapter but departs just as quickly for other tales that may or may not rejoin the narrative thread later on. The Fall of the Year might better be called a collection of short stories interrupted here and there by misplaced passages from a novella. The stories themselves can be delightful, showcasing Mosher's knack for creating memorably idiosyncratic characters. One of the more interesting relationships is Frank's friendship with a Chinese immigrant named Sam E. Rong. In the course of establishing the Land of the Free Emporium, Sam schools Frank in the ways of leading a prosperous life and dealing with hardship — such as the one that Sam himself must endure in Kingdom Common. Other portraits present Louvia DeBanville, the town's irascible gypsy fortuneteller, and Mr. Moriarty Mentality, a traveling mind-reader who gives the town a larger dose of truth-telling than they'd bargained for. Other self-contained stories — such as the tale of daredevil-tomboy Molly Murphy, hell-bent on joining the circus as it passes through town, and the Lacourse-Gambini family feud — recall Mosher's published short works. In an excerpt of book-jacket praise, Angela's Ashes author Frank McCourt compares Mosher to Wallace Stegner, the pre-eminent novelist of the 20th-century American West, and himself a part-time resident of Vermont's Northeast Kingdom until his death in 1993. Though book-jacket recommendations are by definition glowing, the comparison with Stegner is not empty hyperbole. Both authors render the natural world in lush description that avoids rhapsody, which may be Mosher's greatest tribute to his adoptive state. Also, Stegner's best known work, the Pulitzer Prize-winning Angle of Repose, captivates for its breadth as well as the author's poetic vision; the novel mines the humane riches sewn into one family's history. The Fall of the Year, too, has multi-generational scope. Through Father G's "Short History of Kingdom County"-in-progress, Mosher uses the past to vitalize the characters and circumstances in the present narrative. The device allows even this short novel to account for multiple lives lived in the novel's mythical, mystical world — some names readers may recognize from Mosher's other books. The Fall of the Year is not the best of his bunch, but at its peaks the novel reveals a storyteller whose gifts could bear rich fruit for many seasons to come.